2) Washable and Soft-Feel Fabric. 3) Colors: Fluorescent Lime Vest. Silver stripes over Orange striping. 4) Reflective Tapes: 1-horizontal and 2-vertical, 2" wide Reflective Silver over 3" Wide Orange. 5) Size: Adjustable, fits most S to XL sizes over outer clothing. 6) New 100% adjustable front velcro reflective belt for optimal comfort and fit. 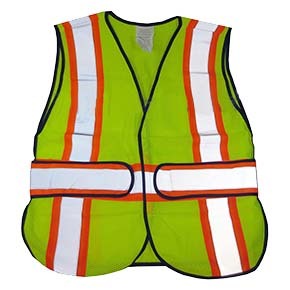 7) Meets DOT requirements for reflective mesh vests. 8) Weather, water and tear resistant. 9) Rip resistant super soft comfort-mesh polyester fabric.